EffOne offers a range of Android application services covering the entire development cycle from concept to delivery. We have been delivering Android applications that are cost-effective, best-suited and compliant. 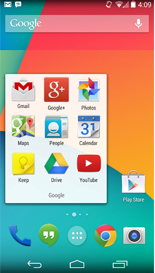 We set ourselves apart by offering the best in class design and quality Android applications. Our team has the knowledge, skills and experience required to successfully deliver your Android apps. We ensure that we understand your application in detail from technical perspective as well as from the business angle and deliver world class Android apps. We have the right expertise in Android OS having worked on various versions and related technologies including "Eclair", "Froyo", "Gingerbread", "Honeycomb", "Ice Cream Sandwich" and "Jelly Bean". We at EffOne develop android applications that are of high performance and are compatible with various brands and makes of Android devices. EffOne's Android application development team has comprehensive understanding of the Android SDK (Software Development Kit), framework and API's which places us in the perfect position to develop robust applications that comply with our client's requirements.